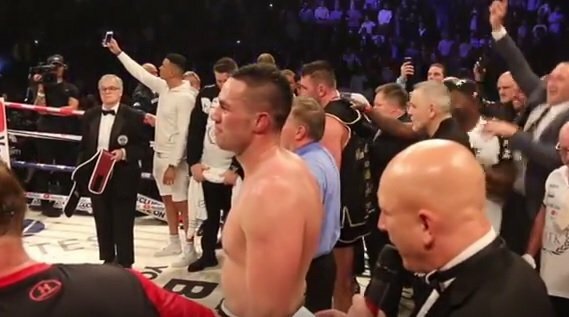 The arguments over this past Saturday night’s Joseph Parker-Hughie Fury fight are still ongoing; with the Fury family being, well, furious over the 12 round majority decision that went to defending WBO heavyweight champ Parker. As soon as the verdict was announced in Manchester, the entire Fury family, along with their supporters and their promoter, went crazy – former heavyweight king Tyson Fury especially (even climbing into the ring, apparently to confront BBB of C head Robert Smith). There were suggestions of “corruption” and of “dark forces” being at work, and Fury and his team may well launch an official protest over the decision (114-114 and 118-110 twice, for Parker). But in speaking with Newshub, WBO vice-president John Duggan said there is “no chance” of the result being overturned. Maybe, just maybe, in light of the seemingly high number of bad, or controversial decisions we have seen in boxing recently, a new system of scoring should be introduced, to replace the existing ten point must system? Just what new method of scoring could be introduced is anyone’s guess, however. Still, it does seem as though something has to be done. But according to Duggan, an appeal will achieve basically nothing (as is almost always the case whenever an appeal is launched over a decision that a fighter and his team felt was unfair) – and a rematch between the two heavyweights is also extremely unlikely. It’s tough not to feel bad for 23 year old Fury, who did indeed box brilliantly (for what it’s worth I had it 7-4-1 for Fury) – but it seems he can do nothing but take pride in a great performance and move on. At the very least, Fury proved beyond any doubt he is a genuine world class fighter.